Although I have lived here in the Pacific Northwest for the last 16 years or so – my roots are definitely southern. I was born in the beautiful state of Kentucky, and between my mom, grandmother, and all those aunts, cousins, and uncles – well let’s just say I was introduced to southern cooking at a very early age. And you know what? They all shared one thing in common……beans. Kentucky Soup Beans to be exact. 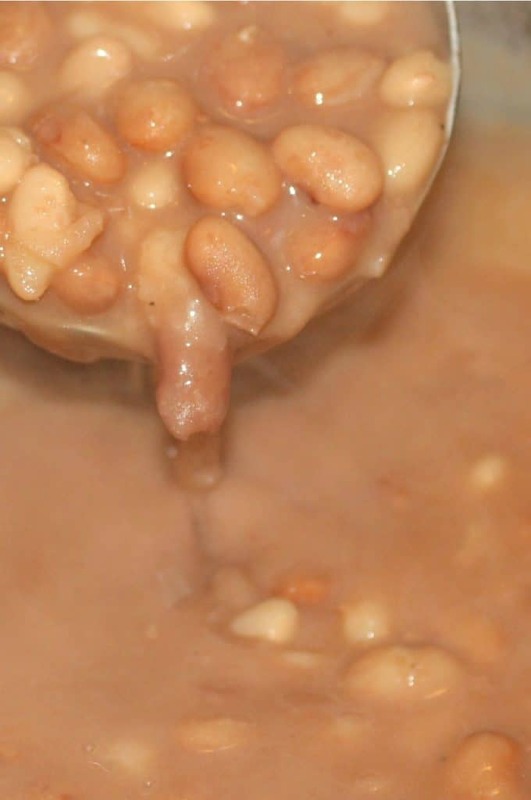 Soup Beans is just the southern way of saying a big pot of Pinto Beans, slow cooked in their own broth , usually flavored with either a ham hock, or a piece of salt pork, and served with a big ole hunk of homemade cornbread. It didn’t matter who we were visiting, there was always a big pot of soup beans cooking on the stove. 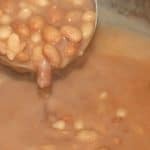 Sure you can buy a can of pinto beans at the store, but there’s just something about cooking them the old-fashioned way, like mama used to, that makes them taste just like home. I mean THIS….. this is definitely NOT what mama used to make! Yikes! I’ll admit, it’s a fairly long process, cleaning, sorting, soaking, rinsing, and then an all day simmer, but let me tell you it’s worth it. Dried pinto beans are one of the least expensive, healthy, items you can buy in the store. They’re loaded with protein, fiber, natural fats, calcium, and even iron too. So although this recipe isn’t exactly like mom used to make – since she wasn’t vegan (and would probably make me get a switch for saying I was) – there are pretty darn close. So get out the crock pot and let’s make some soup beans! Pick over beans removing any twigs, deformed beans, dirt, etc. Rinse well and then place in a large pot and add just enough water to cover. Let soak overnight. The next day, drain beans and rinse well, and return to pan with enough fresh water to cover. 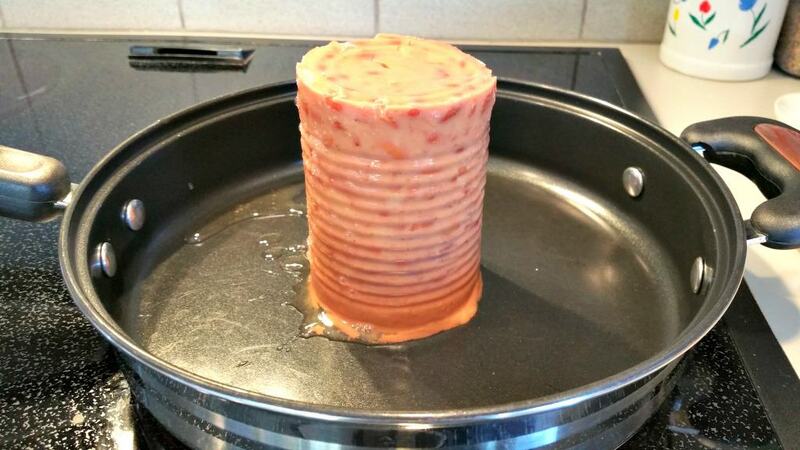 Bring beans to a boil. Boil for 10 minutes and then remove from heat and cover. Let rest for 1 hour. Drain beans one more time and rinse well. This time place the beans in your slow cooker and add the veg broth, the 1/2 cup water, onion, and spices. Cover and cook on LOW 8 to 10 hours or on HIGH for 4 to 5 hours. Keep watch as you definitely don’t want the liquid level to drop too much. If the liquid gets too low – add a bit more water – just enough to keep things covered. Once they’re nice and soft, blend a cup or so of the beans and broth in a blender and add back to the pot. Stir and serve..... preferably with a big ‘ole hunk of vegan cornbread and a Loretta Lynn CD playing in the background 🙂 🙂 Enjoy! It might be a bit close…..my largest corning ware dish is 3 quart and this will fill it up. Maybe try cutting the recipe in half the first time just to be safe…. Has anyone made this on the IP just as tasty because the slow cooking probably enhances the flavor…. I am going to try it in the IP with “unsoaked” beans as soon as my yogurt is finished!! Did you cook this in the IP? Being a tad impatient, I used soaked beans and put all but the salt in the IP on the Beans setting for 25 minutes. I added a sprinkle of salt after cooking was complete. It turned out delicious! This is a wonnnderful family pleaser & oh so budget friendly dish Chuck!! Thank you so very much for this!! My roots are W.Virginia & we grew up healthy, well satisfied and strong on food just like this!! YUM!! I knew you were from Kentucky as soon as I seen the name. I’m from Rockcastle County/ Madison a county with my roots being from Hazard. I now live in NC and everybody calls these Pintos and they toss the broth. I’m trying Veganism out but have been craving soup beans. My mom uses a packet of Goya Ham seasoning (+ bacon grease). But you may want to try it. It’s not healthy by any means but it is yummy flavoring. These are delicious. I only blended about 1 cup of the cooked mixture at the end, I think next time I’ll blend about 2 cups. Thanks for the recipe! The Loretta Lynn CD is definitely the secret ingredient! Saw her in Pike County about 2010 when I was living there and it was great! Thanks for the recipe. Attempting plant based! Just made these again today. Boy are they good! I’m from WV and we simply call them brown beans (and cornbread). My dad made them every Saturday. Yum! I saw your recipe for corn bread (from your Mexican dish with it on top). Can you share with me the names of other back home dishes you’ve converted into Vegan? I really, really loved the way this turned out. My goodness they were delicious. Some vegan recipes I’ve tried have been a let down. Not so with this one. Thank you. I’m the only vegan in a house of four and for once I didn’t mind that no one helped me eat them. So simple yet so delicious and satisfying! Beans are nature’s perfect food for sure! A squeeze of lime, tablespoon of nooch and some hot sauce on top and yum!! !